Very nice view with lake. You'll show back up on the WU Wondermap very soon. It does't take long. A day or two at most...maybe less. All that bad data caused you to get kicked off the map. If my station were to start producing bad data I'd take it off-line right away till the problem is fixed. Then you don't have that bad data to deal with and you get back on the map much sooner. Nice to see the bird spike mod in action. Let us know how it holds up. Well that was fast. I remember that taking longer before to reset and make it back in the map. Nice setup! In that GIF, is it mounted in a different location? Looks midroof...and the pic above looks like it's mounted on the gable end. The roof has 3 teirs. Station is located as indicated by red circle. Galfert has it correct. It is on the mid roof tier, but the extension has the station above the tallest section. 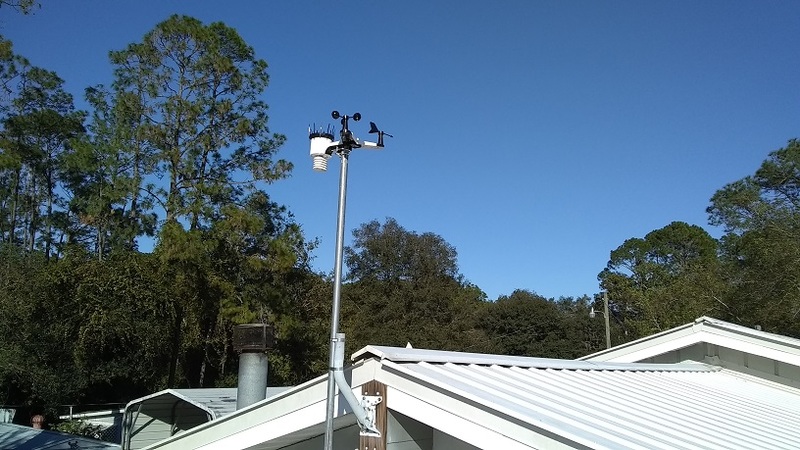 I am sure I have wind "bubble" issues, but honestly I am surrounded by much taller trees than my house on 3 sides, so there is not much I can do to get the wind sensors up any higher. Just wondering. What is the correct Station Model to use with the WS-2902-ARRAY in the OberverIP. I somehow thought it was WS-1900-IP, but I never have gotten that one to connect. I also tried WS-1500-IP and that one connects, but not sure if it is somehow limiting the sensors in the array. Then I read that one should use WS-1600-IP. This one also connects. Which is best? Yep, it is a bit confusing. 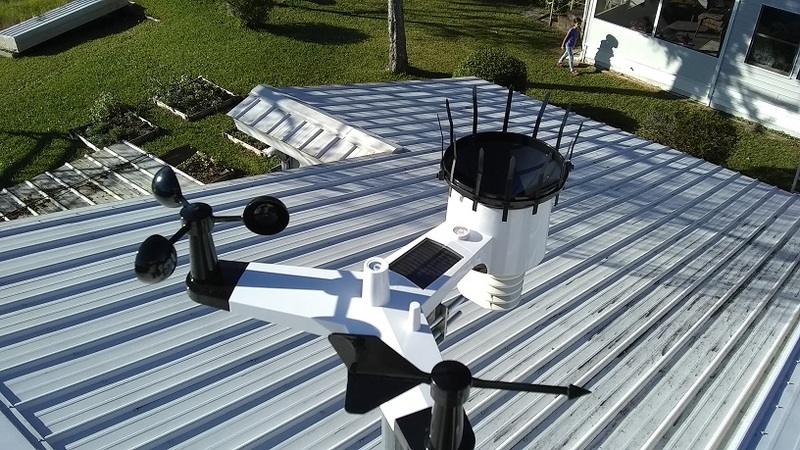 The first recommendation was to use WS-1600-IP for the 2902 outdoor sensor array. But then they started selling the WS-1550-IP which is the same outdoor sensor array without a display and with the ObserverIP instead. So WS-1550-IP also works. I don't know what the difference is between those. I don't have extra sensors so maybe that is a difference. As for WS-1900-IP well that is sold as a WS-2902A outdoor sensor but with a display that has no WiFi (looks like a WS-2902A display). Therefore I don't understand why WS-1900-IP is even an option on the ObserverIP. And I have no clue what a WS-1500-IP is. I really dislike all these model numbers. They are meaningless. A WS-2902A is less costly than a WS-2000 ...why the lower number then? I think it would help if Ambient had kept the same model numbers that Fine Offset uses....that is what other FO clone sellers do in Europe and elsewhere. The WS-2000 was a poor choice as there existed at one point a WS-2000 from Rainwise. Agreed. I just got my WS-2000 today. Decided on this instead of an Atlas. I liked this new array so well, and wanted a display and did not want the 2902a display because of the off axis display "issues". Really like the WS-2000 display. I will repurpose the WS-2902-ARRAY I bought last week to my other location. Gotcha! Thanks for the roof explanation guys! I'm glad to see my zip tie bird spike mod is being used be others. Looking good ! I had a chance to test it last night with rain. Front coming across the southeast went over us about 3 p.m. . My AcuRite large number yard rain gauge measure just a tick under 1/2 in. And the Osprey measured .44. I think they were almost exactly alike. The rain gauge was in the yard clear of obstructions. And the Osprey array was up on my roof.